Update: Tapbots has issued an update to Tweetbot that is now live on the App Store. It fixes some random crashing experienced by iPhone 2G and 3G users. Tapbots highly anticipated Twitter client for iPhone has arrived on the App Store, bringing a level of polish that Pixar would be jealous of. Considering Twitter’s recent stance on third-party clients we may not see many more Twitter clients being produced by developers that are unsure whether they will be able to continue doing business with the messaging site. If those potential clients end up being anywhere near as useful and polished as Tweetbot then that’s a sad state of affairs. Tweetbot developer Tapbots is known for the highly polished look of their apps and consistently striking UI design. This willingness to experiment with the way that users interact with apps permeates offerings like Convertbot with its unique wheel-in-wheel interface that makes total sense with just a few seconds play. Tweetbot has been rubbed and polished at the hands of Paul and Mark, the creators of all of the ‘bots in Tapbots line of iPhone apps. 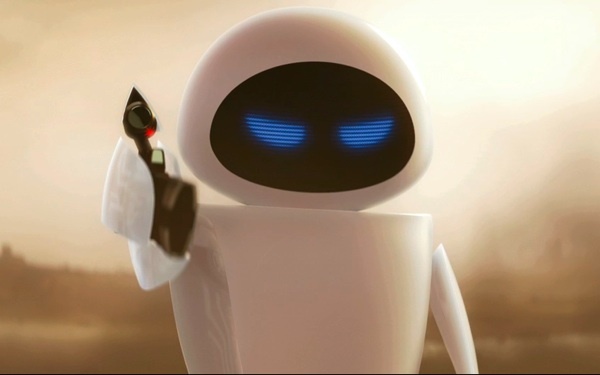 They credit the character of Eve Pixar animation film Wall·e for their idea to create a family of robots as iPhone apps. 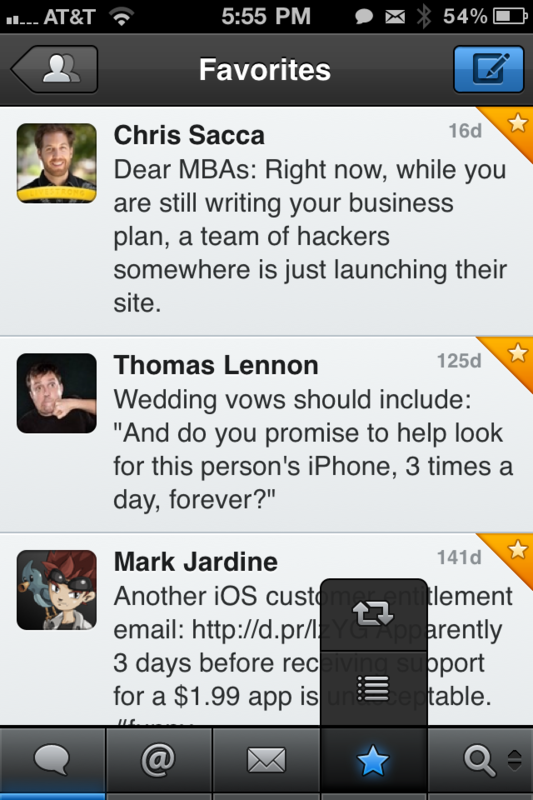 In addition to a striking design and level of finish, Tweetbot features four unique ideas that set it apart from other iPhone apps. 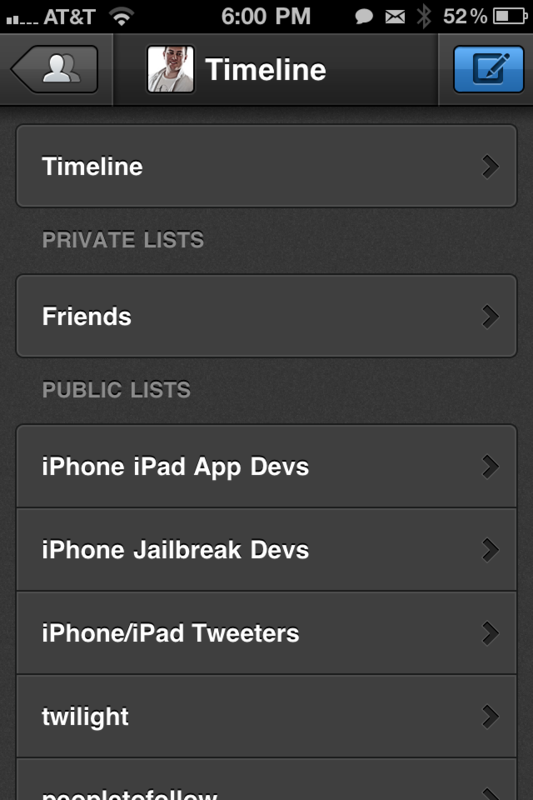 First is the ability to easily set the main timeline to a list. As our Twitter streams get more and more crowded with information blazing by, lists become more useful to help us filter out just the Twitter users we want to hear. The ability to ‘convert’ your main timeline view to a list view quickly is an obvious, but unique move. Next, each Tweet is an active object that you can pull to the left or the right with a snappy return motion similar to the pull-to-refresh action popularized by Loren Brichter in Tweetie. If you pull to the right, you get the conversation of a given tweet. Pull to the left and you get all related tweets. The third refinement is the use of taps on a Tweet to trigger actions. One tap to reveal an actions panel including retweet and reply functions, two taps to reveal the Twitter profile of the tweeter and tap-and-hold to reveal detailed options. The triple tap action is customizable and by default is set to reply. Finally, the bottom right buttons on the toolbar are also tweakable with the option to set them to reveal lists, retweet, search or favorite tweets. 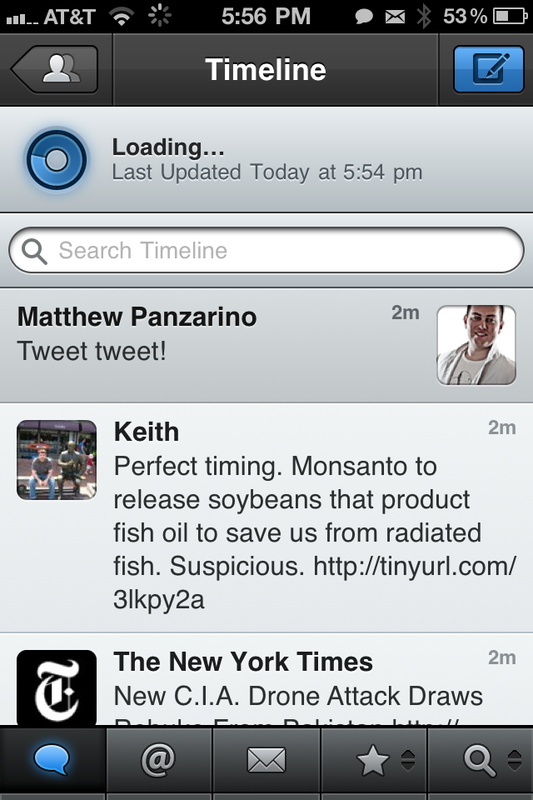 Lovers of the ‘old-style’ quoted retweet will be disappointed to learn that Tweetbot supports only the new pure retweet. There is an easily accessible ‘copy tweet’ option. It also bears mentioning that all of these taps and swipes and UI interactions are accompanied by some of the best sound design of any iOS app on the market. I unmute my iPhone every time I use the great Pastebot just for it’s useful and gorgeous sound. Ben Burtt would be proud. 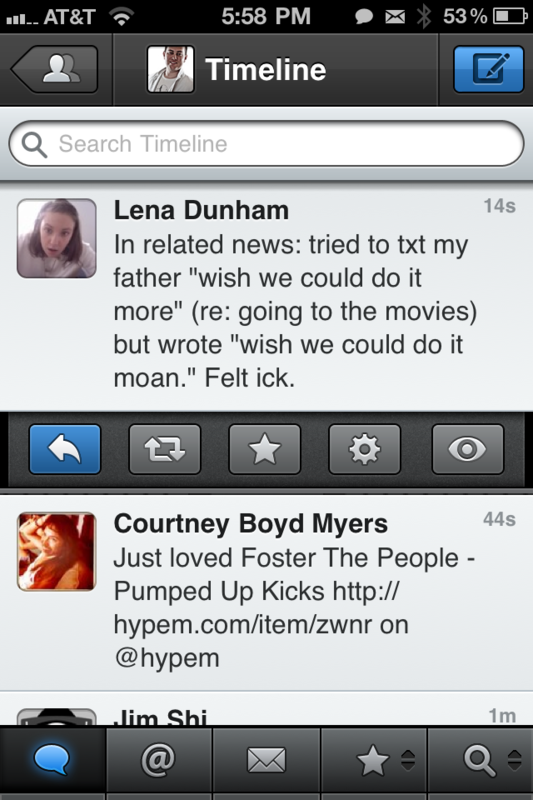 Tweetbot doesn’t change anything that works just to change it. Much of the client works the same way that the stock Twitter app does. Pull-to-refresh, slide down option panels and a visible break between old and new tweets are a few familiar cues. What it does do is add some very useful tweaks and present those in a luxuriously designed interface. If you spend a good deal of your life on Twitter, then you couldn’t find a more pleasant client to spend it with than Tweetbot.